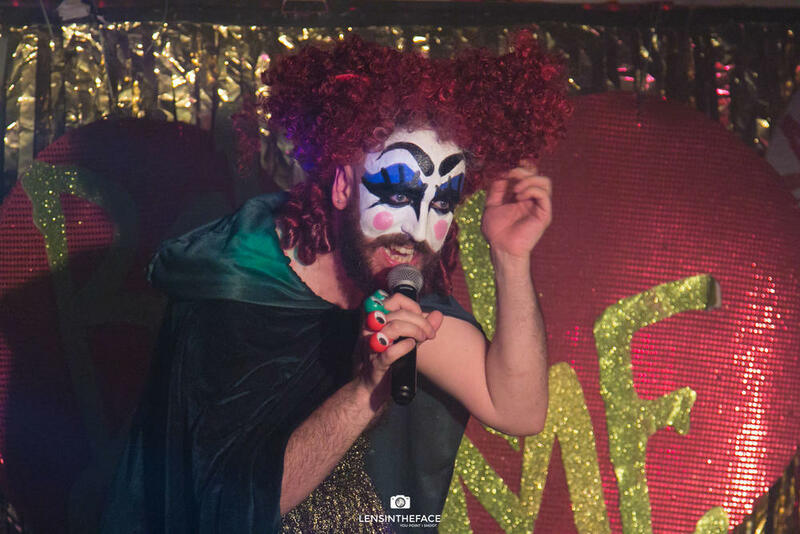 I was contacted by a performer called Baby Lame to shoot his burlesque show at the Glory pub in Haggerston, North London. I accepted the job and immediately used Google Image search to check out the venue. I do this every time for a new venue to scope out the area before attending. I hopped on to the East London line I arrived at the Glory with 30 minute spare till show time. Baby Lame and a couple of other performers were rehearsing the opening act. After which we had a quick chat about where I could shoot and I was given a running order of the performers. I like to keep hold of this as I can then add names of the performers to their respective photos in Lightroom later. Looking around the room I decided not to stay near the bar as that is normally crowded, so I stuck more around the left hand side near the audio visual unit and the centre between the two pillars. After the show, on the way home I started culling shots in camera. The screen in small but I can easily see if any of the shots have blurred limbs or the composition is off. All shots were completed and delivered the next day. Speaking of the next day I contacted a performer Ness Gracious, and asked if she was available for a quick shoot? She was so once more, back on the East London Line up to Rotherhithe station. Ness arrived on time and we walked towards the Thames. The weather wasn't on our side so I had earlier suggested Ness brings an umbrella. Turns out we used it as a prop during the times when it was really windy. While Ness was posing with the North bank of the Thames behind her I could see that where I ever I pointed the camera there was always crane in view! Still I had to set fire to the stunt umbrella that had taken a bit of a beating by the end of the session. We moved on to a local park where a children's play area and a band stand were made use of. We dodged a couple of squirrels and a friendly dog too. I had spotted a small cafe close to the edge of the park and thought it was nearly time to call it a day. While kicking a few leaves around I asked Ness to gather some up and throw them in the air while I try to capture them in mid flight. We had a few goes at it as many of the leaves had their own ideas when it came to gravity and decided to get in front of Ness's face. In the end I managed to stitch a few shots together to make one composition. After which we had a cup of tea in the cafe. I had been contacted by Tempest Rose and she asked if I could shoot for The House of Burlesque at the Rolling Stock club at Hoxton... which is on the East London line. I had not shot there before so I had a look at the interior via Google Images once again. The venue is long and thin and on arriving I was showed where to set up. I noticed it was very dark and a quick test shot showed my ISO would shoot up to 12000. Not to worry I thought, it might brighten up when the performers take to the stage. I was using my 24-105mm f4 so getting wide to tight shots wasn't a problem, and to get a faster shutter speed I dropped the exposure down by 1/5 stops of light. I could always bring the exposure back in post but I was still getting ISO from 3200-12800 so a lot of clean up work was needed after. Having three shoots in rapid succession does sharpen the mind to work faster when making editing choices in Lightroom. It allows fast turn around times so performers get their photos back sooner rather then later. I have to keep my reputation as a 'machine' intact. Adventure time again as I traveled to Greenwich at the weekend. Once more did I ride the tamest roller coaster London has to offer. Stepping off at the DLR station of Cutty Sark I walked around to the park in front of the Observatory. Above me, there seemed to be a large group of people lined up on the ridge. Looked like they were watching me as I walked below them. Continuing on, I had looked at Google Maps first and found a location called One Tree Vista Point. This sounded like a good place to start so I trudged up the hill, which was quite a steep angle. Once at the top I found that there is a path that could have conveyed me to the top a lot quicker and with less slippage. Still once at the top I had a great view stretching from the Isle of Dogs to the right of me, all the way to the Shard, way off in the distance. There were two photographers already there snapping away. I took out my Canon 70d which was sporting the 24-105 F4 and waited my turn. I make a point of waiting for other photographers to finish what they are doing After all they may be on assignment and need the time to complete. Still I managed to snap off a panoramic while I was waiting. I headed further down below the One Tree Vista for a shot across to the Observatory. The sun was setting at this point and was creating a golden glow across the lower part of the frame with red and orange tinged clouds. The sun was setting rapidly and I could see the hoards of 'non waving' people descending towards the park gates. I followed then for a bit then broke off towards the Cutty Sark. I had photographed this before when I had started out in Photography and wanted to try again from a different angle. By the time I got to there it was very dark, so I set up on t he right of the ship and with my tripod set up a couple of long exposures. All the non waving people were now streaming past the ship so a long exposure was needed to blur them out. In homage to the time the ship caught fire I added my own 'ahem' effect.. Feeling guilty about the possibility of digitally burning down a national maritime treasure I walked past Nandos towards the river bank. It was time for another panoramic. This time from the south to the north bank, using the Sigma 10-20mm f3.5 each took eight seconds. I am glad the people on the left of the frame decided to stand still for the duration. I would have been annoyed if they had started to wave at that point. While I was taking a few test shots I noticed there was a couple of spots on the lens which needed cleaning. So I whipped out the cleaning cloth and pen to clean up. I steadied the camera and pressed the shutter button. Thinking nothing of I cleaned the lens. I missed the two second display of the shot the camera recorded and did not see it until I got home. That is a very strange title but all will be come clear! I managed to catch up with Ginger Blush at her one woman show, Nell Gwynn's History Laid Bare in Croyden. I had not been to Croyden before so as normal I made travel plans that meant I was there a full 30 minutes early. Better to be early than late though. The very helpful Google Maps showed me where the Spread Eagle pub was in relation to the nearest fast food outlet. There are times I have found I will be concentrating on the event, camera settings and meeting performers that I forget to eat until after. Sometimes this means eating very late when I get home. So this time I eviscerated two cheese burgers before walking to the pub. Arriving at the location I introduced myself to the promoter and was taken upstairs to meet Miss Blush, who was in a semi state of undress! A quick zip later and we were in the theatre area discussing where I could stand. As a rule I always scout an area out by using Google Images before attending. In this case I had Googled 'Spread Eagle pub interior theatre images' and saw that there would be rows of seats with a central isle. Whenever possible I do like to talk to the performers about the show and ask if there is anything in particular that they want me to capture. I also like to take back stage shots of them getting ready. The shot to the right was taken close to start of the show. During the performance I choose to stand next to the Audio/Visual area which would mean I would be behind the audience. I am Lensintheface by name not in nature! I try to be face on if I can as the performer is generally centre stage most of the time projecting forwards so I would get some great facial and action shots. OK I would get the odd audience head or two in the way but that's live theatre for you and I feel does add to the photos. The lighting was dark to medium brightness but Miss Blush did tend to stick to the centre of the stage where the light was more favourable. I was using my Canon 70d with the Canon 24-105 f4 L lens a combination that is working perfectly. This particular performance, was funny and informative. I found myself at times watching, and listening to the narrative quite a lot. This did not detract from the amount of good photos I managed to capture though. It is good to watch and listen to the performance as you can anticipate the performers next move and capture shots you would otherwise miss. One such shot was of the orange faced puppet mentioned above. At this stage, the history lesson had moved on to where Nell Gwynn became a mistress of Charles II. I think this is one of the most surreal photos I have taken on a stage. This could be the stuff of nightmares for some but for me the sight of a Charles II puppet with an orange tennis ball for a face singing along to the sound of Donna Summers 'I feel love' had me in stitches. The show ended and I had a quick chat with Miss Blush before missing the tram home. While waiting for the the next tram I could hear Italian opera being sung live from a restaurant close by. To speed up the process I started to cull shots in camera using my normal harsh methodology. Anything with blurry limbs are thrown out completely. This meant that I was able, using Lightroom to adjust for white balance across the whole of the remaining shots, to complete the work before midnight the same day. A mere three hours after the show had ended I had linked the shots to Miss Blush via Dropbox. In keeping with the show, I then had some orange juice. Earlier this year I met up with Yvette Jenkins (Burlesque Nylons) and Whiskey Falls for a photo shoot in Balham. You can see the photos from that here. The photo below always stood out for me and remains one of my favorites. In my last blog post here I mentioned I wanted to try this method on a live action shot rather than a still from a video game. This was taken a street away from the Bedford pub in Balham, just under a rail bridge in natural light. When I select a picture to edit, I am always drawn to something about it. In this case it was the contrast of the red hair against the white brickwork. I immediately thought of white flames but decided to go with red flames in the end. Many, many effects were used on this edit, but I found if you use a lot of effects then they can soften the image a little. This this end I sharpened the face, hair and fire effect around the hair and hands. Screw you Whiterun, screw you.. I have been working on a couple of restorations for a while and thought I would shake things up a bit and attempt to destroy one. I didn't want to destroy someone else's photo so I decided to use a screen shot from the Elder Scrolls game Skyrim. This is my character, a Dark Brotherhood assassin sitting on his horse Shadowmere. It is a nice sunny day and in the distance is the town of Whiterun. There is also a dead wolf to the left hand side. This scene was too nice. The character is supposed to be an assassin and looks like he is looking for a nice picnic spot. There should be death and destruction all around not sandwiches and a gingham table cloth. I used a number of actions to create the fire and clouds along with a number of smoke textures from the SLR Lounge Smoke texture pack. The image was then darkened to get away from the 'Sound of music' vibe to create a more death and decay look. If I can do this with a static shot from a computer game I hope to create something with a live action model soon. To see the before and after click and drag the slider. There are times when I think, 'I have my camera with me and nothing is happening' and others when 'I have my camera with me, let me try something'. This something turned out to be my friends 4 year old long haired cat who was sitting on my lap at the time. Curiosity of course meant the cat would want to poke her nose at my lens so why not snap off a shot or two? As the caption says, the above is the original shot of the cat. The expression on the feline suggests she is humouring me but with an intention to pounce when I am not looking. I took this original shot and threw into Topaz Glow. I have used this on many occasions to bring out detail and colour to make a shot stand out more. This was the result. After which, I noticed the fur growing from behind her head has a smoother quality to it. So this time I threw the picture into Portrait Pro and used the hair tool to smooth out all of the hair but leave the eyes intact. I added a red filter over the top which gave me an idea for the next version. For the final version I went a little overboard as I normally do. This 'Lord of the Rings' inspired shot was created by using the Ice Cream version, adding more red, along with a smoke layer, a bokeh layer which was stretched and had the Radial filter applied, as well as a debris/star field added and blended in. Thankfully the cat was not after my one ring at all, just the cat treats in my pocket. I have visited Brighton four times now to see Violet Blaze. A lingerie shoot, a bikini shoot which ended up with my face turning into a strawberry due to the blazing hot sun. A bikini plus baby bump shoot, and this latest visit was for her wedding! I have not shot a wedding before so was understandably a little nervous about it. I arranged to go down to Brighton the day before as I would not want to have the trains mess me around on the day. The wedding was at 12 o'clock so I had to be ready. I arrived at the Kings Hotel on the Brighton seafront. The blurb says it is six minutes from the beach... errr no, it is literately a stone throw away. It seems a lot of people must have tested this as Brighton Beach is full of stones not sand. As requested the hotel had provided and ironing board and iron as I have bought with me some smart cloths to wear. I know I am taking the shots but I wanted to look smart for the day. I unpacked and went for a walk on the beach towards the shattered remains of the west pier. I had taken shots of this before but I had planned to be at the area while the tide was out so I could get closer to it this time. I had noticed a wedding party emerging from the beach and heading towards a grand hotel as I was walking towards the Kings, and now I spotted the bride and groom having photos taken down by the sea edge. I snuck a quick photo in myself my hiding behind one of the rusted pillars of the west pier. Continuing on from the pier I walked up towards the centre of Brighton in search of a fish and chip shop. What trip to the beach would be complete without a portion of chips in a cardboard cone? Mine it would seem as I couldn't find one. I found one nestled between a row of restaurants and book shops fairly close to the Kings Hotel and trudged back to my room and made full use of the tea and coffee making facilities. While editing the shot you see above, my thoughts turned to the shoot the next day. It was at the town hall. I had not been there before so I wanted to be early to see if I could scout out the room and get an idea of where to stand. I was also thinking about the flat screen telly in the room looked like it was about to fall off the wall. It didn't. The next morning after polishing off the free breakfast, downing tea and orange juice, I set about making sure my shirt and trousers were ironed and got ready for the shoot. At 11:00 I left the Hotel leaving all the towels, fixtures and fittings where I found them and walked to the Town Hall. I walked in and asked where the room was and I was allowed to quickly see the room before everyone arrived. The groom arrived first with a couple of guests so we shot a few photos on the stairs first, then Violet showed up, surprised to see me shaved and smartly dressed for once. We took some more pictures on the stairs of the wedding couple and then we were let in to the room. I placed myself behind the large desk where the registry was located. The wedding couple and guests would be sitting in front of the desk in a semi circle. I planned to move back and forth behind the desk as there was enough room to do so. I am used to shooting live events and up to that point I was relaxed and ready to go. That evaporated as soon as the couple walked into the room, then the adrenaline kicked in and I started shooting the same as I would do at events at the Royal Vauxhall Tavern or Madam Jo Jo's before. During the moments when the registrar office staff were talking I would wait to snap off a frame in between the pauses in the speech. I had the Canon 70d on silent shutter mode but it isn't that quiet in a small room! Switching around while the couple moved to the large desk I now sat in the grooms chair and took photos of the signing of the register. This made some great shots including one of Violet dabbing her eyes in the background while the box that contained the rings is sharp in the foreground. After the ceremony the doors to the square outside were opened and I got ready for the confetti throwing. Quickly checking the settings I was getting 1/80 at 100ISO. More than enough to capture flying confetti. Again, as soon as it started flying I focused on the couple and fired off frameafter frame. After some food and drink we moved outside of the reception area and took a lot of group photos. The guests then left me with the couple to take some more shots. I noticed a bush which had purple coloured flowers growing on it which matched the colours of the bride and groom. This session was easy to do, the bride and groom posed easily and were comfortable in the surroundings. I was asked to get a shot of the wedding rings. I did not ask them to take them off so we could pose them with flowers or on a reflected surface as I have seen others do. We agreed that having both close together while still in place on the fingers would be great. Now with a lot of experience with the 50mm f1.8 I thought I would have to take a number of shots due to movement of the hands and myself spoiling the shots. Out of the twenty or so shots I took to ensure success... the first one was the sharpest.. In conclusion, I got every shot I wanted to get,and although it was a small wedding I enjoyed the adrenaline and resulting photos that were captured. In hindsight I wouldlike to have had a bit more time before and after the ceremony with the couple but time was permissible. Would I do another one? Oh yes! OK the odds of this happening are very small but I wonder if anyone in 7th century China, after watching a firework explode over head, had any idea that centuries later I would be photographing a performer call Red Sarah on stage at the Royal Vauxhall Tavern in London? Probably not. The art of pyrotechnics is lost on me. I light the blue touch paper and run. So it was a great surprise to see not one but eight devices being used on stage. I have seen fire performances before but not live sparkling fireworks held above someones face! I was happy with the original frame seen here but the lighting on the skin caught my eye so I made a mental note to make this the image to edit. I firstly went over the image and cleaned up some of the distractions. There a couple of sparks at the top and around the main grouping that needed taking care of. Some of the highlights of the curtain behind the performer were just a little to bright. A couple of wrinkles on the dress had to come out. Used the clone stamp to add back the addition of one of the pyrotechnics that didn't fire on the night. This clean frame was duplicated in Lightroom and exported to Topaz Glow. After playing around with the settings I found one that looked liked the skin was translucent enough for the bone structure and veins to be seen. This was saved back to Lightroom and both it and the clean frame were sent kicking and screaming into Photoshop as layers. I created a black layer mask over the Topaz Layer and named it 'Skin'. I then used a soft white brush and painted back the Topaz level. The effect only really worked on the chest and arm areas. I wanted to leave the face as it was and left the neck mostly intact. To the left is a 100% close up of the detail. It really did look too much like a cadaver was up on stage if the effect was all over. I added a curves layer to brighten and enhance the area below the waist as this was a little to much in shadow. These two layers were combined to a single frame back to Lightroom. I have been playing around with using selective blur on my edits and this was no exception. I opened the image in Photoshop made a copy of the layer and added around 40% Gaussian Blur and a Radial Blur. These are the two main effects I have in my work, they complement each other so well in shots like these. I added a black layer mask on the blur layer and used a large white brush to bring back the layer below. This really anchored the performer to the center of the image, focusing on the head below the sparking firework. I then added a sharpening layer to the face, hair and exposed chest area. Below is a before and after. The selective blurring technique is one I intend to employ a lot for now on to drag the viewers eye to the focus of the image. I also intend to purchase a few more plugins to add to my work flow. I have always been an advocate of using little plugins that can make a massive impact to an image. Well worth the money! This blog post has been possible with the blessing of the performer Red Sarah. I am challenging myself to pick a shot from each shoot I do and create a more advanced edit that I would normally do. This will keep my Photoshop skills up and I can learn new techniques as I work. On the 12th of June I was asked to shoot for the House of Burlesque at the Electric Carousel in Piccadilly. It was a standard shoot of the show with a few shots of the stage and audience thrown in. Images were sorted, edited and delivered the next day. I then looked for which of the shots I would like to edit beyond the standard. I choose a shot of performer Trixie Kixx. There were a number of things that I wanted to change from the original. I was going for a ‘vampire’ type vibe as an end result. This was taken with my 70d and the Sigma 70-200mm f2.8. The red curtain needed to be removed in favor of the better right hand side of the frame. Skin needed to be smoother and somewhat waxier. The lighter and darker parts of the clothing needed to be enhanced. If the above worked I should be looking at something that may have been shot in a crypt rather than on a stage. One of the first thing I did was to clean up the image, using the spot healing tool in Photoshop CC 2015 to remove scrapes, blemishes and other pieces that I knew would be trouble and stand out later. On the inside of the coat there looked to be stains of some sort. These turned out to be flower patterns woven into the fabric. I didn't think flowers were very 'vampish' so these were removed. The next stage was to tidy up the curtain on the left hand side. I used a shot a couple of seconds after this one where there was more of the right hand side showing. I add this as another layer and used a mask to remove the parts of the shot I didn't need. The mask followed the line of Trixie's arm and right leg. I then decided it would be a good idea.to blend the two layers together to make a background layer and then create a mask of Trixie herself to aid in edits further on. I darkened the Background layer a little to reduce the red glow. I made a copy of the Trixie layer and used a slight Gaussian effect to blur the skin. Again a mask was used and brushed back the clothing and necklace. This smoothed out the skin and allowed me to also add a brightness layer to brighten the skin and make it stand out from the background. A Trixie layer was exported back to Lightroom and opened in Topaz Glow. I had an idea to enhance the clothing and necklace. Choosing a preset and saved back to Lightroom, opened back into Photoshop and copied to the main project. The whole of that layer was effected by the Topaz Glow effect so I added a mask and brought back only the areas of the clothing that I required. However this had the effect of making the highlights look like diamonds. It was a nice effect but not what I needed here. So I used and Curves adjustment layer and reversed the effect. This had the effect of darkening and reddening the detail which fitted the vampish effect I wanted. I darkened the rest of the clothing to make it darker than it's original color. The final TIFF was saved with ZIP compression to layers so the overall size was around 600mb rather than 1.4gig. Final adjustments were made in Lightroom were used to sharpen the red highlights of the clothing and headpiece. With slight darkening around the edges of the arms and legs just to blend Trixie in a bit better with the background. Adjustment brushes were used to lighten and De-saturate the skin where needed. I didn't want the skin to look to undead like but not quite 'alive' if you know what I mean. Finally I used a custom preset to darken and add a slight blue tint to the background. This needed removing from Trixie again so back whet both the darken and normal images as layers and the the dark parts removed. The final image is below along with the original for comparison. Trixie Kixx is a Neo burlesque artiste with all the curves and all the moves! Follow Tixie on Twitter at https://twitter.com/trixiekixx/, Facebook and Instagram. Thanks to Trixie for allow me to feature her performance in this blog post. Worth having arms of lead. 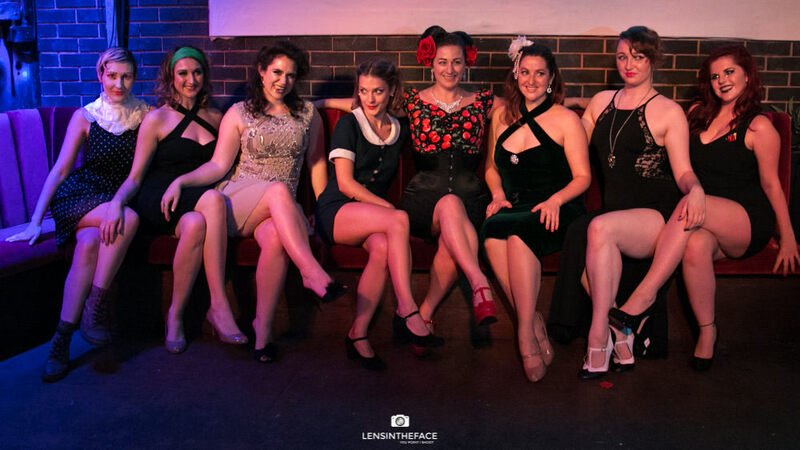 Recently I was asked to shoot Burlesque Idol at the Century Club in Shaftsbury Avenue. I was using my Sigma 70-200mm f2.8. The heavy lens! After nearly two hours of shooting my arms felt like lead. During the shoot, one of the performers was Fräulein Litchi Klein. I reviewed the pictures and found one that I made a note of to work on later. The next day after the photos of the whole show were sorted and sent to my contact, I turned my attention to the photo. Now this is not a bad shot to begin with but there were a number of things that stood out for me that needed changing. After sorting out the light flare above the head, I then threw the image into Portrait Pro. PP can sometimes exaggerate features so I always tone it down to taste. The first thing was the to clean up the skin, not that there was anything wrong, I was after a certain look. I smoothed out the skin, reduced the shine on the right cheek, even shifted the light source around to the front of the face a little. The focal point of this photo for me is the expression of the face especially the eyes. The whites of the eyes were brightened and the eyebrows, lashes and lips were darkened and enhanced. The hair tool was also used. I love this tool as it is similar to the Oil Paint filter in Photoshop CS6. I highlighted the entire head of hair (not the initial area chosen from the program) and ramped up the effect. This filled out the hair and made it more wavy, also added a little bit of purple to match the lip colour. You may notice the hair decoration have been changed to little heart shapes. This was from a program I am trialing called Exposure 7. I wont go through each of it features but the one I like is the Bokeh feature. You can de-focus and blur areas while causing the highlights to take on certain shapes, from triangles, hearts and squares among normal aperture lens types. You are given tools in Exposure 7 to de-focus areas; a circular tool to draw attention to certain areas, a single line type, I suppose this would be good for landscapes and a double line type useful for making tilt shift effect images. Neither of these options worked for me though. So I removed the default and blurred the entire image. Even the talents face was a blur of hearts. This image was saved with the Portrait Pro version and thrown from a great height into Photoshop as two layers. I then added a black layer mask to the Bokeh image. Then used a soft white brush to bring the Bokeh image back through, therefor being 'selective' about where I wanted the Bokeh effect to appear. This also had the effect of blurring out the audience members quite nicely to as they were a little too sharp in the original photo and tidied up the background too. The last point that for me was a bit distracting was the streak of light opposite the right knee. This was sorted out by Lightroom using the spot healing brush, covering up the light source with a patch of darker curtain close by. Finely, used an adjustment brush to add vibrancy to the costume. I asked Fräulein Litchi Klein in advance if it was OK to include the original and enhanced versions within this blog post. I know the copyright is mine but I feel it is very important to at least contact the performer and make them aware of its use.Fräulein Litchi Klein will be receiving a framed print of this shot very soon! Another trip out to London this week. Today was the turn of East London to grace with my presence. I found myself on the East London tamest roller coaster, the Docklands Light Railway heading towards Pontoon Dock. I had already scouted the area using Google maps. The area I was traveling to was right in front of the Thames Barrier. I had seen this in pictures before but not first hand. Walking down the five flights of stairs to road level I then headed south from Pontoon Dock and through the Thames Barrier Park. Not a very original name I thought, unless occasionally large barriers would get in the way of patrons and then flood them for no reason. Then I would find the name acceptable. Winding my way the families enjoying picnics, strangely bearded youths thinking they can skateboard and the odd flying football I arrived at the edge of the Thames. I was so disappointed... I thought the barrier was going to be much bigger than I thought. Now there must have been studies of how effective this barrier would be but if the North Sea ever decided to go shopping in Oxford Street I will not think twice about building a raft. I wasn't going to waste the day so got out Jerry and Stubby and got to work. There were a lot of seagulls relaxing and drinking by the waters edge. Looked like some of them were on a package holiday from the south coast. You could tell as they were bigger due to them being fed chips all the time. Walking west along the bank I stopped in front of a small jetty. The bars had a small padlock in front. Looking left and right there was no one in sight but I thought as soon as I step out onto the jetty then the river police would arrive and give me a good kicking. So I stayed where I was and watched as two seagulls faced off against each other, I called them Nick and John. To be honest if you did swap the faces of two seagulls noone would notice. From here I couldn't walk much further without falling into the Thames so I walked back an decided to make a panoramic of the barrier to the still staring seagulls on the jetty. I took seven shot and used Lightroom 6's new panoramic tool to stitch them together, no need to jump into Photoshop to do it anymore. Jumped back on the East London Roller Coaster and headed to Blackwall. I got off looking for this black wall but found nothing. I watched as a train pulled in and thought if I race to the other end I can take a snap while it leaves the station. I may have mentioned my pack is quite heavy before so jogging along a platform brought an element of danger to the day. I braced against the platform wall of the station, (which wasn't black) and fired off a few frames as the train left for the next stage of it's mildly entertaining ride. This shot looked so ordinary in the back of the camera so I thought I would boost it a little in Lightroom/Photoshop. The East London Roller Coaster would be much more fun if the speed was anything like which this end result portrayed. Phones, tablets and many bags of chips would be ruined by the colossal G-forces this produced. Fortunately the train back was not going at warp speed so I arrived home without being covered in chips. OK so I was wrong. I first met Ruth at Madam Jo Jo's while watching and sometime photographing at Cabaret Roulette. She plays a character called Lady Lylith DeHaviland, an Aviatrix Extraordinaire (ish), Host, Singer, Lush and Opiate freak. Click here for the full set of photos from Ruth's photo shoot. So there I was finally getting off the train at York station. An hour and a half late, tired, hungry and annoyed that I had missed the sun that evening. It has been a long time since I had the opportunity to visit York and I remember wanting to take a lot of photos next time I went. I was up on business for my day job, this wasn't a social visit... or so I thought. I was there for two days and after checking in at the hotel I decided to take shots of the hotel room. Wasn't that interesting until I picked up a towel from the bathroom. Hmmm I thought lets play around with this. I had my tripod with me so I set up my Canon 70D and fired off a shot with a 2 second delay of the bathroom using my 10-20mm wide angle lens 'Stubby'. I then carefully moved into the bathroom with the towel, hit the timer and threw it over my head. Whipping out my laptop I threw the two frames into Lightroom, made a few adjustments opened them as layers in Photoshop and masked out my arms and legs. Punching through a few effects and the usual radial filter added to this spooky shot. York was built on the River Ouse. For a while now I have wanted to use Stubby to take a long exposure on a river that wasn't the Thames. The shot below was taken at Wellington Row just past the bike sheds. There is a little flight of stairs leading up to the back door of the bike sheds. I set up the tripod and selected bracketed exposure settings in the camera. The result was stunning. Stubby can be really sharp and you can also see some stars that were caught in the exposure. The bright light behind the center building was the moon. If this had been in the shot then it may not have been as good as the light from the moon would have over powered the shot. Love the way the water now looks like glass. Further south from the Ouse there is Station Road. Just as it passes underneath the city wall. From there I could see York Minster in the distance and thought the line of the road stretching out before me was a nice run up that would track the eye. However once I was editing in Lightroom I noticed that my eye was drawn more towards the car in the foreground. I decided to make that the focus of the shot and subsequently de-focus everything else. I used a cold blue palette for this shot. It had been raining before hand so I wanted to keep that look. I selectively blurred out most of the background till just before the roof of the car. I then used, believe it or not, a stock picture of leather skin to form the rain. The picture was manipulated in Photoshop and finally motion blurred at a slight angle to create the rain. I had nearly finished when I noticed I had left the number plate of the car visible in the shot. A few minutes of cloning sorted that! Earlier in the week I had arranged to meet Yvette from Burlesque Nylons in Harrogate. It was a thirty minute train ride from York and my evening was clear so yeah lets go! We met outside the station and we went to a bar called the Blues Bar in Montpellier Parade. We talked about photography, burlesque and product shots. I suggested we try a few shots now! This would be my second shoot in pub, the last was the Bedford, Balham in June of this year. The bar wasn't crowded so Yvette quickly changed and modeled the 'Fully Fashioned Point Heel, red metallic seam' for me on the stairs right next to the main doorway. I didn't use Stubby for this as it would have been too wide a shot. I would have got Yvette, the bar and most of Harrogate if I had used that. This shot was taken using the Canon 50mm f1.8. So to summarize, when visiting one of the oldest cities in England, there is no need to take photos that everyone else does, pretend your a ghost, stand next to a river, ignore the background for a strangers car and borrow a friends feet for the evening. October already and my thoughts travel to the future... where is my hover board Zemeckis? This project means I select a place in London and at the same time each week I take a shot in the same direction. At the end of the project I would have built up 52 shots documenting how the area changed in a year. The area selected would have to have noticeable changes, not from week to week but at least in how it looks. Perhaps a spot in a public park would be good as the seasons would change the landscape. This project would mean I would stay in one place from dawn to dusk. Preferably this would be done around now in Autumn rather than long summer days. I would like to capture the sun as it rises from the horizon, to where it sets. I know my wide angle lens would not be enough for me to lock the camera off on a tripod for the duration and snap a photo each hour. I would have to move it slightly so the whole sequence would be captured. Bit of maths to work that one out I think. I have noticed that these project are all time based. Anyway this idea is I buy a flower… and let it die, taking a shot each day. Of the projects so far, this is the easiest to do and would not cost much in time or money. It would also be better than using a piece of fruit and watching it rot. Ok I know you are wondering ‘this is an excuse to go to the pub’ and you would be right… however I recall this is something my father used to do when his hobby was photography. I don’t recall why but I do remember traveling to London, walking around watching him take shot of pub signs. It would be very interesting to do over 40 years later, until I found out there are nearly 7000 pubs in London…. It would mean an awful lot of walking around. I will have to think of something else… let me know if you think of anything yourselves. When I first started in photography all my shots had a watermark on them. It didn't cover a large portion of the photo and was slightly faded as to not distract from the content. Recently there have been a couple of occasions where I have found my photos on social media sites and normal websites without the requested credit links or even just my name. I do ask everyone who uses my shots that they have a credit attached to the content, whether its a post on Facebook or part of a performers portfolio. a working, click-able hyper link back to my web page is sufficient. Those whom I have contacted have corrected the oversight when requested but it is not something I should be asking. From now on I have decided to reinstate by watermark on all my photos. It is small and unobtrusive so wont get in way of the content. There are other ways to protect my copyright, I have the original files with date stamps and metadata plus I can always embed more information with a stenography program. I will try that and blog about it. Below is a picture I took at Madam Jo Jo's recently. You can see the watermark at the bottom right hand corner. Since taking up photography I have had contact with a number of fellow snappers. Each have been helpful and willing to impart advice when asked. I hope that I have been able to do the same. On to this afternoon. While looking through a number of older shots to see which I could mash together in a composition, I noticed a post on Facebook from Elspeth Van Der Hole. She was having trouble opening .NEF raw files from her D800. The files were not being recognised by Photoshop CS6/CC or Lightroom 5. Even a DNG converter turned its nose up at it and walked off. I fired off a message to Elspeth who I had recently contacted about her Youtube video discussing how photographers are increasingly told 'sorry there is no money for photographers right now blah blah blah do it for free etc etc'. I offered to take a look at the an example file for her, this would show if the error was the files or an installation fault. Elspeth uses a Mac while I use a PC, two different computers but the programs are the same so this would be a good test. Elspeth sent me a drop box link of a .NEF file, one of her dog, Bear. After downloading it I threw it into Photoshop CC. My first thought after seeing this was 'corrupted file'. No matter, I thought as I tied the file to a house brick and flung it screaming into the bowels of Lightroom 5. The 'corrupted file' idea was now dancing around the back of my head whirling twin emergency flares. This problem reminded me of a time when I was asked to fix an import problem from a Nikon camera where I work. I suggested that instead of using the supplied transfer software, they instead could try copying the files from the card to the hard disk and see if they can be opened from there. This was the same problem for Elspeth too! Can you tell she was happy with the result? The moral of this story is, as the title of the post suggests, back to the Bear basics. I don't use any third party copying program. I would if it did something spectacular beyond copying files for me. I leave all that up to Lightroom 5 to drag them off the SDHC card. I was glad to help out a fellow photographer!